Not that I have a whole lot of time for reading these days, when I do, I’ll often grab something food related. So last night I cracked the cover on acclaimed blogger Molly Wizenberg’s book, A Homemade Life. So far, and I’m only few pages in, and the writing is compelling. 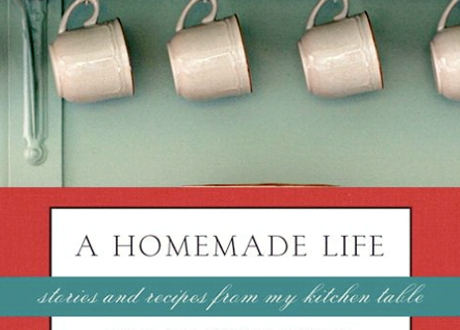 Wizenberg that recounts a life with the kitchen at its center and weaves an engaging tale. Oh, and there are recipes! Following the death of her father, Wizenberg was supposed to be researching for her dissertation in Paris when she realized that her true calling was food. Her blog, Orangette, started out as a detaled chronicle of her Parisian food encounters and then became the vehicle that changed her career path. This book is also based on it. If you liked the story of how Julie Powell cooked and blogged her way through Julia Child’s Mastering the Art of French Cooking, then you’ll probably have an appetite for this. You can catch Molly for a book signing and afternoon tea at Barbara Jo’s Books to Cooks next week, Wednesday, June 16th at 3:30pm. BONUS: Tell us about a fond foreign food memory, or share a recipe that’s been passed down to you and we’ll draw for two copies of the book. Then you can take it with you when you go see Molly. In keeping with the Parisian theme, I loved having crepes with butter and sugar and strolling on the streets of Paris. =) I was immensely satisfied with the butter and sugar version that I didn’t feel the need to try the Nutella one! Oh nice. I love her blog. I’m going to have to pick a copy of it up. We’ve recently moved from the Middle East and miss authentic arabic food we enjoyed there- kebabs, hummus, clay oven baked bread, rotisserie chicken, shawermas…hmmmm. Need to plan a trip! This sounds like an incredibly engrossing book, Ben! Thanks so much for sharing. My mother used the pie dough leftover to make “Pet de soeur” which translates “Nuns farts”. Of course, us kids thought this was pretty funny. Preheat an oven to 350F. Line a baking sheet with parchment paper and set aside. Roll out the pastry dough into a rectangle. Brush the butter over the dough, and then evenly sprinkle brown sugar over the butter. Roll up the pastry dough into a tight spiral. Slice it crosswise into pieces of 1 inch wide. So many fond foreign food memories…awesome fresh fish tacos on the beach in Sayulita, bouillabaisse in Aix en Provence, some sort of cheese-filled dough in Goreme. Really, isn’t food one of the best parts of travel? When I was 8 years old, I was lucky enough to spend a year abroad, as my dad was on sabbatical that year. We stayed in France for 6 months, where we lived in a gîte on a pig farm. 1,000 huge pigs are noisy in the morning, let me tell you. My top 3 food memories from that time are all quite simple, but nonetheless special for me. In no particular order, they are: 1) being sent into the town bakery, along with my brother, to buy a baguette: the elederly woman who worked there (I think she was at least 95 years old at the time) would always look at us and say, “Ahh, les Canadiens!” ; 2) eating pâté for lunch, and feeding some it to the farm dog, Frida; and 3) going over to the farmers’ house one evening for omelettes: Mme. Tarlet made them using 2 frying pans, flipping them from one to the other, which was the coolest thing ever. Also, the best omelettes ever. Although not out of my country, the northern part of Canada might as well be. I was lucky enough to try musk ox scalopine working in a lodge. It was delicate and wonderfully delicious and was eaten under a sky of northern lights. I would love to be there once again. My favourite foreign food memory is being Spain, picking something off the menu and then looking it up in the dictionary. We then noticed all the staff behind the bar snickering at us. They then sent one person who spoke English over to see if that’s really what we wanted. Turned out to be one of the best meals of the trip. Fried eggs, blood sausage and pickled peppers on a bed of potato chips. Near the end of a foodie week in Sidney, Australia, where my boyfriend Alan and I snacked on meat pies, slurped rock oysters, and supped on Moreton Bay bugs (a kind of lobster), we came across a restored Victorian gingerbread house-turned-restaurant in an urban artists’ quarter. As soon as we sat down, the waiter appeared, as if on cue, with a plate of appetizers and two flutes of sparkling wine. He stopped, his face suddenly a proud grin. When he didn’t, I began to cry.